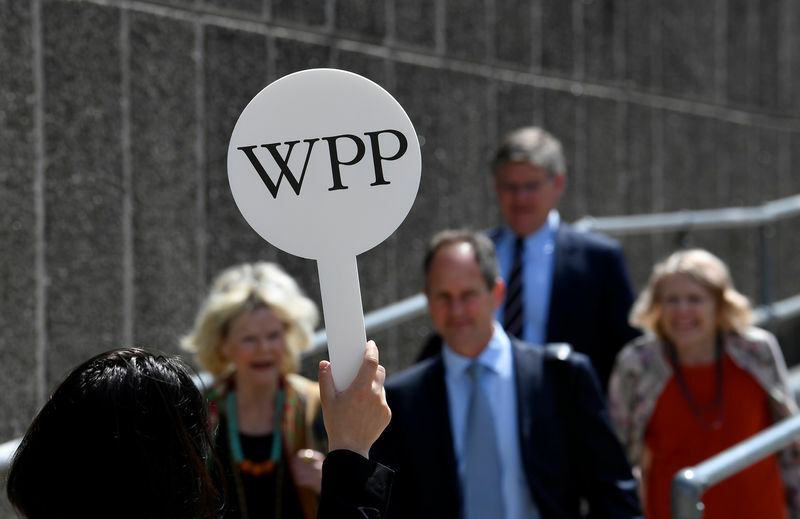 LONDON (Reuters) – The world’s biggest advertising agency WPP (L:WPP) faced a shareholder revolt on Wednesday over its handling of the departure of former CEO Martin Sorrell, who quit under a cloud but is still entitled to share awards worth millions. The most famous advertising executive in the world, Sorrell left the marketing giant he built from scratch following an allegation of personal misconduct in April. In a sign of investor concern, nearly 30 percent of WPP shareholders failed to back the group’s executive pay proposal at its annual meeting, while almost 17 percent of shareholder votes declined to support the re-election of Roberto Quarta as chairman. Under Quarta’s watch, Sorrell, 73, was allowed to leave with share awards worth millions of pounds intact and without a non-compete clause. The departure of one of Britain’s best known businessmen has rekindled arguments that have dogged previous WPP annual meetings – that WPP paid Sorrell too much and did not prepare for his succession. The nature of the complaint against Sorrell has not been disclosed by either Sorrell or the company. Sorrell – who has already launched a new venture – has denied any wrongdoing, and the chairman said there was nothing more he could say on the issue. “I know that questions remain, but there is simply nothing further we can legally disclose,” Quarta said at the start of a meeting that lasted little more than an hour. Trying to refocus the meeting on the future of the business, Quarta told investors that the hunt for a new chief executive was well advanced and moving ahead rapidly. As well as anger about Sorrell, investors also had questions about the group’s strategy after performance disappointed in 2017, when it delivered its worst annual sales performance since the financial crisis. The two chief operating officers currently running WPP, Mark Read and Andrew Scott, are reviewing its strategy, and Read, seen as the leading candidate to replace Sorrell, said he was confident about the future. “I think the business can succeed without him (Sorrell),” Read said. “People inside the company have every confidence that we can do that. We need to find a new beating heart for the group,” he told investors. WPP is the world’s largest ad group, employing more than 200,000 staff in agencies including JWT, Ogilvy and Finsbury to serve clients such as Ford, Vodafone (LON:VOD) and P&G. The group has recently been hit by the might of Google (NASDAQ:GOOGL) and Facebook (NASDAQ:FB) in online advertising, the advance of consultants like Accenture in the sector and by pressures on big ad spenders such as P&G and Unilever (LON:ULVR) which have all hit the bottom line. But in a trading update published to coincide with the annual meeting, WPP reported four-month net sales which were marginally up, an improvement on the 0.1 percent fall in net sales in the first quarter. Liberum analysts said the improvement should give investors confidence that the company can meet its guidance for flat sales and margins this year. “The statement today should reassure that this is more than achievable especially as WPP is expecting a pick-up in the second half and the comparisons, particularly in North America, get easier,” they said in a note. WPP shares were little changed at 12.45 pounds at 1310 GMT, having gained an initial boost from the update. Quarta defended the company’s response to the allegation against Sorrell, saying it was robust from a governance and legal perspective. While he accepted criticism from investors over future share awards due to Sorrell, he noted that these pre-dated the current board’s involvement. It is not the first time investors have expressed opposition to WPP’s pay proposals. Sorrell has earned around 200 million pounds ($268 million) in the last five years alone, and in 2016, a third of WPP’s investors refused to back his 70 million pound pay package. Nearly every question asked at the meeting, which was packed with shareholders, was about Sorrell and his departure, and not everyone was critical. One investor asked why the chairman hadn’t started by leading a tribute to a man who had built the company from scratch.